WowLights Dumb RGB Floods include a 10W RGB bulb that can change to red, green, blue or any color in between. They include 6ft input & output leads so you can connect multiple floods to maximize coverage. 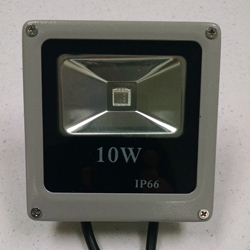 They are IP66 rated and can be used both indoors and outdoors. Nodes work with our RGB DC Controller and RGB Accessories. These are basic nodes (entire strand changes to the same color). If you are looking for smart RGB lighting (control every bulb independently) check out the Light-O-Rama Cosmic Color Devices.